“The fox knows many things, but the hedgehog knows one big thing” – Archilochus. So said the Greek poet Archilochus. In this formulation, The Beatnix Cafe is a hedgehog. They know one big thing: casual lunch fare. Sandwiches, soups, baked goods, coffee. That they do this one thing with skill and class can be measured by the brisk business they do every week day, feeding the masses of office workers from Downtown and the surrounding neighborhoods. Everything at Beatnix is made fresh, and it shows. My roast beef sandwich was quite good, but there is only so much one can say about a roast beef sandwich. It was fresh and delicious, and the whole grain bread was hearty and flavorful. The real star of my meal, however, was the chicken noodle soup. I may be getting on in years, but I can still tell the difference between fresh chicken soup and fresh-from-the-bag chicken soup. This was one of the best versions of the former that I have encountered in OKC. If I didn’t work right next to Big Truck Tacos, there is a chance that I would eat here every day. There’s something comforting about it, like a library or a friend’s living room. Bottom line: If you are looking for foie gras or fusion cuisine, look elsewhere. 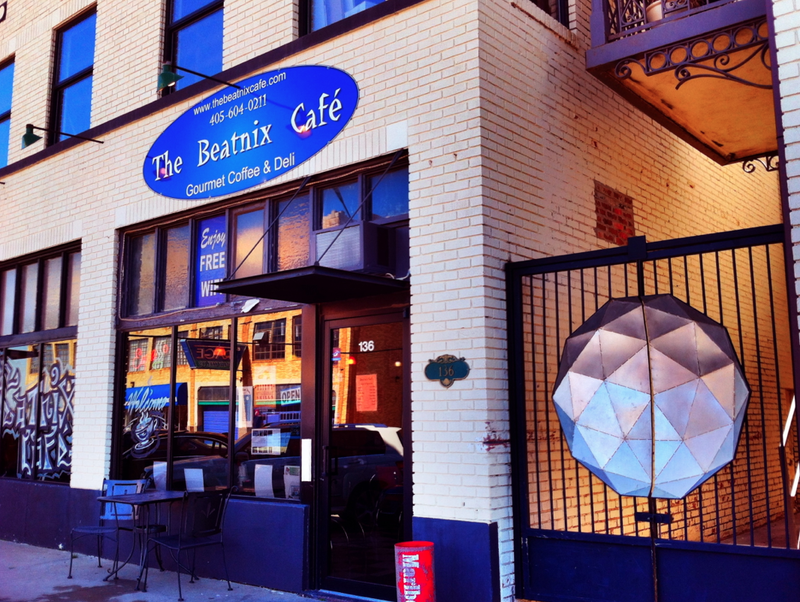 If you want a good, wholesome and inexpensive lunch in a comfortable setting, try Beatnix Cafe. Tagged Beatnix Cafe, Beatnix Cafe Sandwich, Big Truck Tacos, business, class, Elemental Coffee, Left Big Kahuna Surf, OK, OKC, Oklahoma City, options, PT, Street Oklahoma City, youth. Bookmark the permalink. sounds great, but does this place have an address? Thanks for noticing! It does, and we’ve now added that information at the beginning of this article.